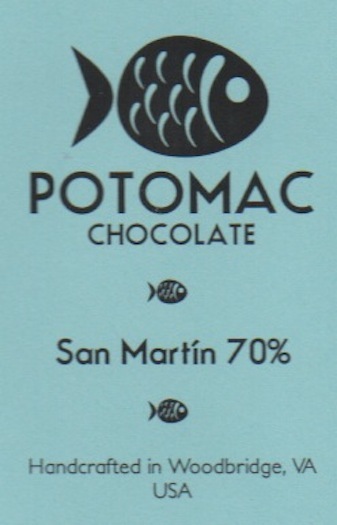 Potomac Chocolate operates along the very river near the English settlement of Jamestown, Virgina. There, the respect between John Smith, the leader of the colony in those first cold winters, & the indigenous Powhatan confederation that then inhabited the area, earned Smith the title of werowance – ‘a chieftain among the Whites'. Yes, Millennials, history began before 9-11. People actually roamed these parts here prior to the arrival of Spanish, English, French, Dutch, Asians, Africans, Hispanics & Al Queda. In fact, some ancestors of the earliest Americans share a cultural history with cacáo in places like Peru -- from where Ben Rasmussen of Potomac Chocolate sources the cocoa in this bar -- having evolved for tens of thousands of years together in the Amazon. For this chocolate Potomac lives up to Smith's famous decree that 'he who shall not work, shall not eat', laboring long & hard to earn Ben the moniker of the werowance of barsmiths (pun included). All consumers have to do is put their money where their mouth is & open wide. A bargain. Ben Rasmussen treks the Upper Amazon for this his 2nd origin after inaugural bars -- 70%, 70% with NIbs & 82% -- all featuring Costa Rican cacáo. Aptly motto'd after a fish (the glyph for cacáo in ancient Mesoamerica) pulled from the river of its namesake, Potomac reels in a good one with the Aromatics. The actual Flavor however cuts bait with much of it: a lot of headnotes left on the hook while the rest of the body gets tossed back in a sort of 'catch 'n release'. Blame it on an unimpressive seed lot; astringency & liquor impressions signal a sub-ferment; precious little core chocolate & consequently only a light ballast for any bottom. But whereas the Mast Bros mishandled the same allotment by under-processing, causing this cacáo's substantial acidity to spill over with un-contained vengeance, Potomac regulates while levering it to the threshold.